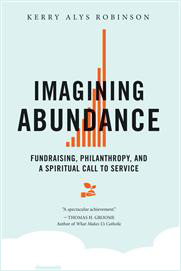 Editor’s note: In her new book, “Imagining Abundance: Fundraising, Philanthropy, and a Spiritual Call to Service,” Kerry A. Robinson offers a guide to effective fundraising, situated in the context of ministry and mission. In this excerpt, she writes about the importance of enthusiasm and delight, drawing upon her earlier work as development director for the Saint Thomas More Catholic Chapel and Center at Yale. I was neither qualified nor eager for the role of director of development. The timing was terrible, and my ill-informed impressions of fundraising were shameful. In fact, I viscerally blanched at the thought of the responsibility. The task was presented as low-stress, part-time, entailing very little travel with a modest goal of “only” $5 million. None of which, of course, ended up being the case. Fr. Bob was persuasive, kind, and inexplicably certain that I was the right person for the role. When I did agree to work with him after five meaningful days of prayer, he was elated. At which point the goal doubled to $10 million. Three months into our work together, fueled by a passionate commitment to bring a Catholic intellectual and spiritual center of consequence to fruition, overwhelmed by the magnitude of work our aspirations would entail, sleep-deprived with a newborn at my constant ready, Fr. Bob -- my prime collaborator -- gave me a present. It was an elegant plaque that said, simply, IT CAN BE DONE. It sat on my desk, a daily reminder of a truth to which we were both committed. Failure was not an option, for the beneficiaries of our effort were not us, but generations of students not yet even born. We were going to do this, and do this right the first time. We shared a sense of urgency. And as long as we were dedicating all of our energies to this pursuit, we were determined to aim for the highest levels of quality, creativity, and excellence in every aspect of our vision. Terrifying. But it can be done. Unwavering conviction that it can be done is essential to success in any endeavor but is especially true for those aspirations deemed impossible. I have cherished this first of many gifts from my extraordinary colleague and now lifelong friend. IT CAN BE DONE became our touchstone when all the odds seemed stacked against us, when the work became increasingly demanding, when obstacles appeared out of nowhere, erratic, unpredictable, and sometimes shocking. Knowing it can be done militates against the temptation to surrender or downgrade one’s vision, to acquiesce to what others will insist are more realistic expectations. Of course, knowing it can be done is not, in and of itself, enough. There is also the necessity of hard work, the willingness to live by the maxim that much can be accomplished when no one cares who gets the credit, an indefatigable tenacity, and a genuine fidelity to purpose. But there is one other essential quality, often overlooked or disregarded. This time it was my turn to offer him a gift. For Christmas I wrapped and presented an equally elegant, equally instructive plaque that said, IT CAN BE FUN. Anything worth accomplishing is worth accomplishing well. The bigger the vision, the more demanding the task. Bringing potential to fruition is not for the faint of heart. But right in the midst of the arduous demands of the task is the chance, indeed the requirement, to bring joy to the endeavor. We learned to celebrate often. We celebrated small steps, triumphant accomplishments, mistakes along the way, and the sheer privilege of lending our lives to something larger than ourselves. We looked for reasons to be glad. We focused on the present and what we could do now that would bring future beneficence to others. We sought to find the humor in many situations. We lived out of conscious gratitude. We took delight in people we met, adventures we had, and ideas that surfaced, regarding all as essential pieces of the mosaic being wrought through diligent labor. Confidence and joyful passion are an irresistible combination. It can be done, and it can be fun. Excerpt from “Imagining Abundance: Fundraising, Philanthropy, and a Spiritual Call to Service,” © 2014 Kerry A. Robinson. Permission granted by Liturgical Press.